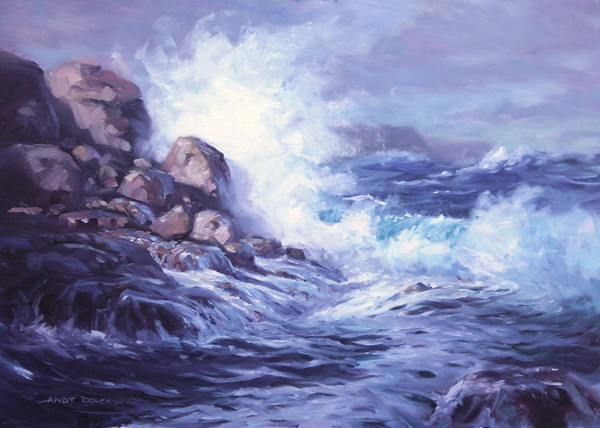 This is part four in a series which began with "Genesis of a seascape in oil". 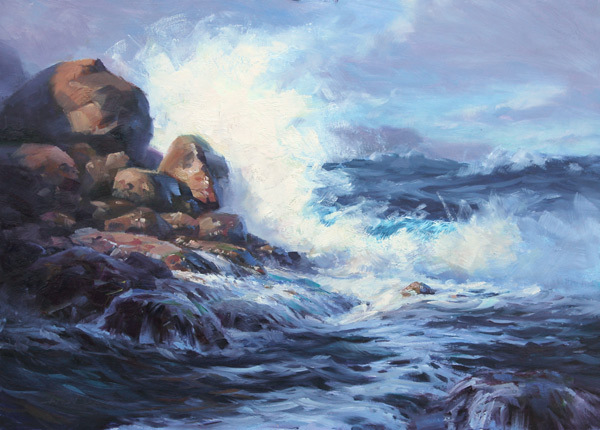 In parts one to three, I explained how I took an abstract concept sketch, done in Photoshop, and developed it into a detailed reference for a seascape painting. We are now looking at how these early stages will evolve into a finished oil painting. Here's where we finished in step three. 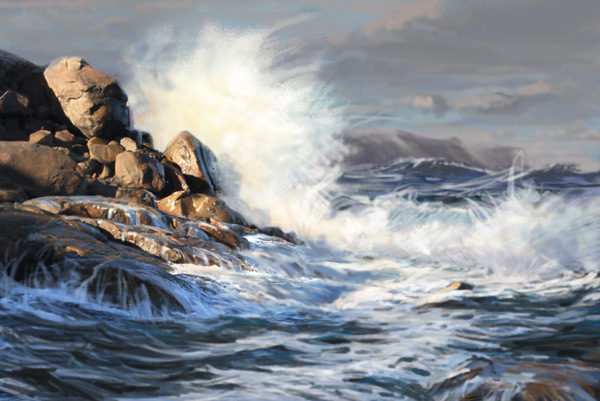 Except for the rocks, this image is all digital painting. I took this into the studio and used it to create a 255 x 355mm painting in oils. For the initial painting, I used just ultramarine, burnt sienna and yellow ochre as I was more interested in shapes and overall design at this point and didn't want to get bogged down in colour decisions. I used a little lean medium to help the paint to dry a bit faster. I let this dry for a few days and looked at it whenever I entered the studio. I also checked it out in a mirror and this showed up a few things that needed some attention. I put it back on the easel and, with a few extra colours on the palette, I worked over most of the picture, making subtle adjustments to shapes and edges and pushing some colours and contrasts. Here's how the painting stands at the moment. I warmed up the rocks to give me a stronger colour contrast, warm against cool, orange against blue. I've also done quite a lot of modelling to create more interesting shapes within the rock mass. 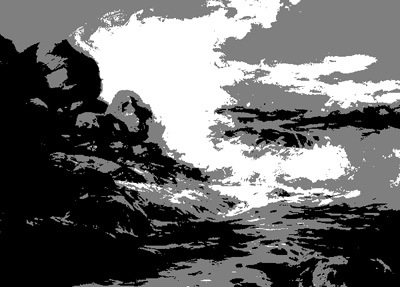 I've also adjusted the shape of the line where the rocks meet the water as it was too geometric before. As I mentioned in part three of this series, the strip of foam that weaves its way up from the bottom of the picture is an important part of the composition. In the under-painting it was rather solid and needed breaking up a little to make it more a part of the water's surface. Here's a tonal map of the painting, created using Photoshop's posterize feature.